People have often asked me how my sister, Greta, and I come up with our trademark “looney,” kinda quirky (and sometimes ingenious, if I do say so myself!) recipe titles and other zany ideas. With four cookbooks now, we’ve somehow managed to come up with about 500 recipe titles. Phew! That’s enough corny to make the Green Giant salivate! Some of my favourites: The Blah-Shank Redemption, Skewer Always on My Mind, Ladle Gaga and One Flew Over the Couscous Nest. Some duds that we obviously dreamt up way past our bedtimes or (more likely) after a glass of wine (or two): Bread Pitt (a date loaf), Edgar Allan Poultry (for when you’re raven-ous), Pamela Anderson’s Melon Balls (sorry!) and the Anti-Separatist Breakfast (French Toast made with English muffins). I think my sister and I both dream in puns, actually. Sad, but true! In fact, we both keep a pen and pad of paper on our bedside tables just in case some cuckoo idea manifests in the middle of the night. And often it does! That’s exactly how our “grEATing cards by Janet & Greta” came to be. About five years ago, Greta had a dream that saw us launching a line of cute and clever greeting cards that contained recipes and cartoons. In her dream, we launched the cards with Hallmark. Her dream was so vivid that she actually woke up at one point, put pen to paper, scribbling down everything she could remember, and then went back to sleep. When she woke up again in the morning, she realized that she had sketched out the concepts for 14 grEATing cards! She showed me the sketches the next day and without hesitation I told her we HAD to do it. We just had to go for it! I loved them! We mocked up several grEATing cards, and then Greta managed to get a meeting with top executives at Hallmark Canada. Little did she know that the Big Kahuna–the Prez of Hallmark himself–was going to be at the meeting. Gulp! Nervous but confident, she recounted the entire story about her vivid dream to the Hallmark team, and gushed with enthusiasm as she unveiled the sample cards. Ta da! To which Greta SHOULD have replied, “Show me the money!” She didn’t, unfortunately. The rest is history, as they say. My sister and I had a crazy deadline of about one month to create 50 grEATing cards in various categories – birthday, anniversary, get well, thank you, etc. We had our bionic cartoonist, Ted Martin, drawing up our ideas around the clock, arm practically in a sling. But we did it! Our innovative grEATing cards were sold at Hallmark Card stores across Canada, and people seemed to love them just as much as we did. Greta and I work really well together. A lot of women tell us that they could NEVER work with their sister, but our relationship just works. We can easily finish each other’s sentences and I often know what she’s thinking or is about to say. (Better think twice, Greta!) Watching us speak is a bit like watching a tennis match, back and forth, back and forth. Janet. Greta. Janet. Greta. It’s actually a lot of fun! As kids, we had crazy, wild imaginations. Greta and I are the two youngest in a family of six girls. We’re just over 11 months apart in age (busy Mom! ), both born in the month of April. 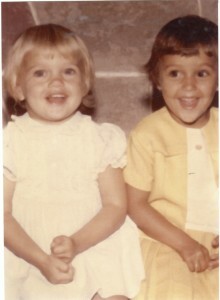 Our other sisters are 9-16 years older, so we were really the spoiled babies of the family. By the time we came around, I’m sure our Polish parents just threw their arms up the in air, rolled their eyes and said, “Vvvatever.” We all shared one bathroom. Six girls. One bathroom. Poor Dad never got in there except for a drive-by shaving. No wonder our personalities are a tad warped! Plus, we grew up on a steady diet of really bad 70’s sitcoms: Brady Bunch (our fave! ), Gilligan’s Island, Bewitched and I Dream of Jeannie. Then there was Scooby Doo, The Flintstones and Bugs Bunny. Oh, and I can’t forget Happy Days and Laverne & Shirley. Classics! Such thought-provoking, intellectually stimulating television programming is what shaped our brain cell activity, making us the women that we are today: Very silly! What I do remember clearly from those childhood days is having NO problem whatsoever entertaining ourselves WITHOUT television or without many toys, either. Of course, we didn’t have gadgets and gizmos and electronics like today’s youth. No, we whiled away the time playing a whole lot of hide and seek, even climbing into our clothes dryer or contorting our bodies in the linen closet to escape being caught. Greta spent a weird amount of time up in our cherry and pear trees. Doing what, I don’t know. She also did gymnastics on our picnic table, a la Nadia Comaneci. Back flips, round-offs, all kinds of tricks and theatrics, for which my Dad and his Polish friends would occasionally give her quarters. I was always dribbling a soccer ball around trees, breaking windows accidentally with tennis balls and somehow stirring up trouble. Actually, our wild imaginations got us BOTH in big trouble an awful lot. Like the time we tied our bikes together and road them down the busy highway, pretending to be a train, I guess. We biked clear across town, miles and miles from home, me on my lime-green, stick shift three-speed, Greta on her blue banana-seat beauty. I remember picking up a bottle of pop and chips at a little variety store and then attempting to ride down a steep hill while holding the goodies, riding using no-hands. I went flying down the hill and over my handlebars, mangling my stick shift and breaking my bottle of Coke into a million pieces. I think we were 7 or 8 years old. One of our Dad’s friends saw us pedaling underage on the wrong side of town and snitched on us. Busted! Janet (who was lying in bed sick for two days) texts Greta: I feel really sick! Can hardly lift my arms to send this text. Yucko! Greta: How long til meds kick in? What about drinking lemon in hot water and napping? Janet: Napping?? Genius! All I CAN do is nap! Want soup, but don’t have the energy, or groceries…or you to make it. Greta: Soup would be good! Need soup delivery service. Janet: I know! I just said that to Leanne (my best friend). Greta: Soup for Sickos. I’ll start the trademark papers tomorrow and incorporate! Janet: Likes!! It will become a franchise and make millions! Greta: Might not fly in summer months. Janet: Fly…soup…Ha! Yeah, you’re right. Need a truck to deliver popSICKles then! Greta: Frozen soup sticks? That’s kinda gross. But I like your name! Greta (on a roll): The idea of fortified popsicles (like Emergen-C) is not a bad idea! Moms would buy for kids. Could have Echinacea, vitamin C, etc. For cold and flu season. Janet: I was just typing that idea! PopSICKles for sick kids and sick grown-ups, too! No crappy, sugary ingredients to wreck immune systems further. Just the good stuff! Janet (Thinking): Hmmm. But I bet Popsicle Pete would sue us for using that name. Drat! Greta: Crap. Back to Soup for Sickos! Janet: Not as good a ring as popSICKles, but it’ll have to do. I will drive the first truck. It could be shaped like a bowl, with spoons as tires. Chug-a chug-a down the road it will go! Greta: Well, perhaps Soup for Sickos could just be a product in a jar. The best soup possible to cure a cold or flu. Like our recipe, The Chicken Soup that Flu the Coop. Janet: Better name than Holy Crap, and it’s selling! Greta: Same idea…the name gets attention! And that’s basically how we come up with most of our ideas: A collaboration of minds seriously warped by Brady Bunch re-runs and by holding bladders for too long, too often. Not that I’m about to drive a soup-shaped truck down Highway 401 or that we’re going to launch Soup for Sickos into stores across the country any time soon. Thanks for your sponsorship of the Canadian mens curling team. My wife and I seen “Looney Spoons” on their pants and a quick google and here we are. Good placement of your name. Hope it pays good dividends for you. My wife is very curious about what you do with your recipes. Hi there! Our Looneyspoons Collection was the #1 selling cookbook of 2012, and it contains 325 healthy and delicious recipes, plus loads of nutrition and weight loss and anti-aging tips and lots of humour and fun. Hope you can check it out sometime! We are SO proud to sponsor the men’s curling team. Go Canada! I too want to thank you for sponsoring curling! We love your cookbooks and use a couple of your recipes as part of our regular repertoire. Thanks again! Thanks, Sheri! We’re so proud to sponsor the team!